Imagine your favorite slice of pizza. The way the heat rises from the top. How the crust feels on your fingers, and the way the cheese–melty, gooey, delicious cheese–runs down the sides. Close your eyes and imagine that first bite. Is it the sauce you picture? The basil? The tomatoes? No, it is the cheese. And why is it the cheese, you ask? Well, my friend, it is the cheese that makes a pizza, a pizza. Cheeses of all types are a common denominator in most Italian dishes. For pizza, it is essential. After all, it can’t truly be a pizza without the cheese. But what do you really know about cheese, besides the fact that it is creamy and scrumptious? La Cucina Italian Eatery is here with the cheese facts to tantalize your taste buds. You will amaze your friends and family with your cheese knowledge on your next Conshohocken family outing. Mozzarella is the classic cheese of choice for pizza. Mozzarella cheese originated in Italy, and is traditionally made from the milk of water buffaloes. Because these specific types of water buffalo are not a native species in the United States, most of our mozzarella cheese comes from the milk of cows. Another fun fact about mozzarella cheese: It is eaten fresh within a few hours of being made, unlike other cheeses that are aged before being served. Pecorino romano is a cheese of hard texture with a salty and sharp flavor. In Italy, pecorino romano cheese is made 100% from sheep’s milk. But like mozzarella, it is made from the milk of cows in the United States. Pecorino romano is a special cheese, whose origins extend back into ancient times where it was a dietary staple of Roman citizens and soldiers alike. This amazing cheese is beloved by cheese connoisseurs all over the world. Called parmigiano reggiano in Italian, parmesan has its roots in the Parma region in Italy. It takes its name from its region of origin, and a true parmesan cheese is produced by cows that have only been hay-fed. There you have it! 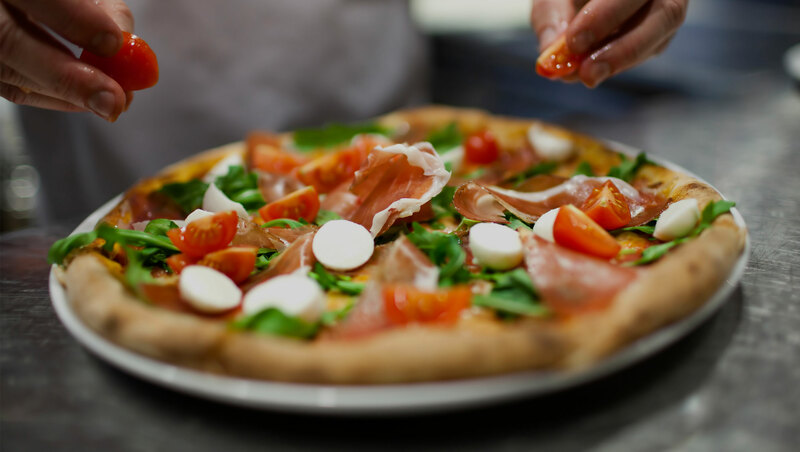 Next time you sit down at La Cucina Italian Eatery to enjoy a slice of our Margherita, Paesano, or Rugoletta pizza, you can wow your friends and family with your newfound cheese knowledge. Don’t wait, come and visit us today! Buon appetito!